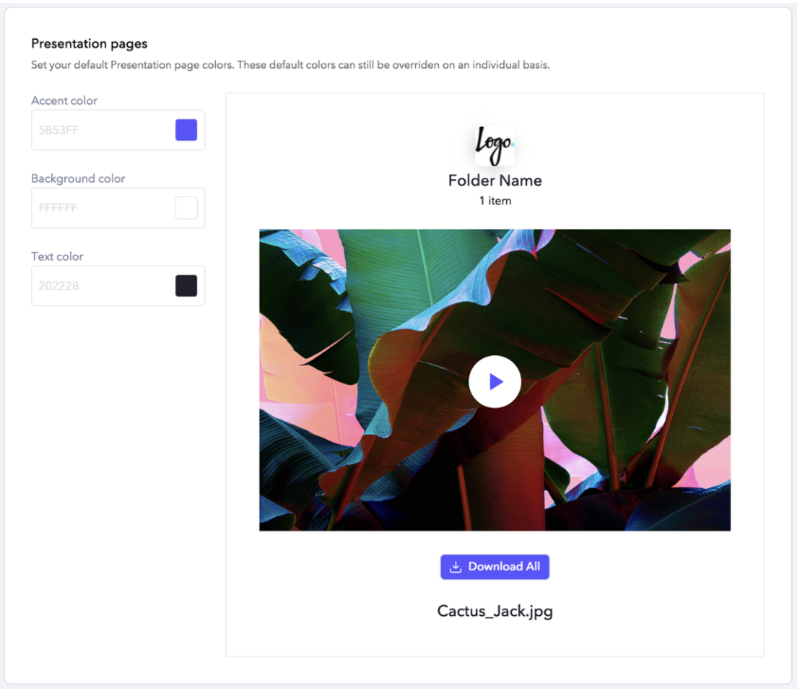 Frame.io Admins and Team Managers can configure branding defaults for their team's Presentation pages. Every new Presentation created thereafter will have its colors default to the team's configured defaults. If a team member wants to depart from the team's default colors, they can still do so when creating an individual Presentation. Select Account Settings > Branding. If you're on an Enterprise plan, you'll then need to select the team in your account for which you'd like to set brand defaults. In Branding, three fields control the color defaults for your team's Presentation pages. If you're visiting this setting for the first time, the colors displayed are the colors that were last used on a presentation created within that team. Click “Save Changes” at the bottom of the page, and you're all set. Q: Will any existing presentations be impacted when I change the branding defaults for my team? A: No. When you change your team-level branding, you're only changing the default colors for new presentations created after that point. Any existing presentations will keep their existing colors. Q: How did branding settings work for presentation pages prior to this release? A: Previously, a team's branding colors were controlled on the presentation editor and were global settings for the team, meaning that if you updated the brand color on the presentation editor it would update for the rest of the team as well. This made it very difficult to govern branding settings effectively across larger teams. With this release, admins can set the default colors for a team, while still giving their end users the ability to customize presentations for specific audiences when needed. Q: I'm on an enterprise account and manage multiple teams. Can I set branding defaults at the account level? A: No. Today branding defaults can only be set at the team level.